Gooseneck Hitch for a Semi-Tractor: Tow a Gooseneck Trailer with a Semi-Tractor! The 2-5/16 inch standard gooseneck ball is released by turning a handle 90 degrees, and can be turned over for clearance so you can tow with your 5th wheel hitch. Other gooseneck ball options are available such as a 2-5/16 inch heat treated stainless steel ball with a 45,000 GVW rating, 3 inch gooseneck ball, other special height balls or an inverted 5th wheel kingpin. The gooseneck ball is round and rotates in its socket which keeps the socket clean and can save ball life if you have a coupler that is of poor quality or is rough which a lot of them are. The ball is locked in the one-piece machined steel socket with a stainless steel spring and locking pin. Simply rotate the handle to retract the pin, pull the ball out and store it inverted out of the way in the socket giving full access to your 5thwheel hitch. The frame is the same for both models: fabricated from ½ inch high grade steel--not A36 structural steel. The frame has two openings to each side and behind the gooseneck ball to connect safety chain hooks to. This frame is rated to 45,000 GVW. The 205ST30K unit comes with a standard gooseneck ball, which is suitable for any standard gooseneck trailer. The 205ST45K comes with a 2-5/16 inch heat treated stainless steel gooseneck ball and a 45,000 GVW rating. 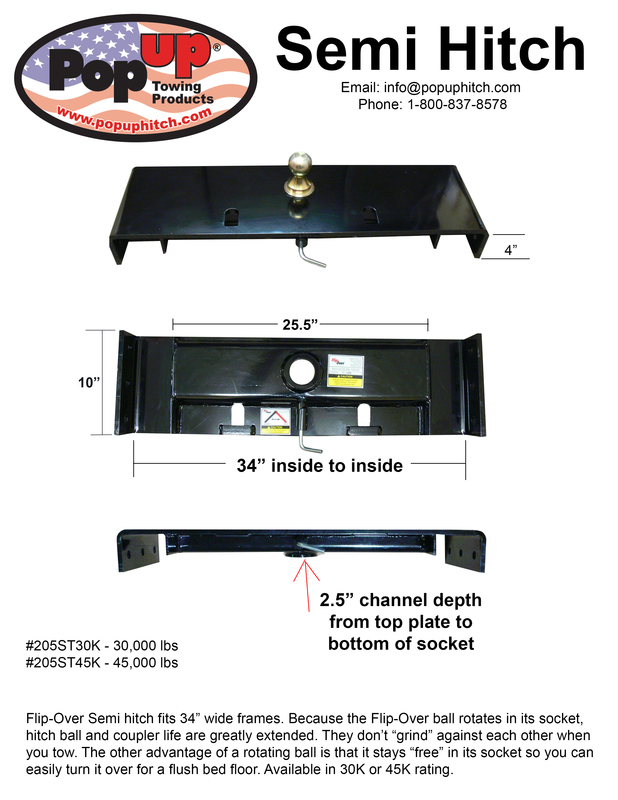 The hitch installs behind the 5th wheel hitch on your semi-tractor and sets over the frame. It requires 10” lateral on the top of your frame and 4 inches down the side. It has three ¾” holes on each side to attach to your tractor frame and six ¾ inch grade 5 bolts are included. An order received by noon centeral std time ships the same business day. 205ST45K - Semi Tractor Gooseneck Hitch 45,000 lb ball.